Diana Bishop has spent her entire life trying to deny who she really is. The only child of two powerful witches, orphaned when she was just seven years old, Diana has rejected her magical abilities, determined to pass as human. But with her unwitting discovery of a mysterious manuscript long hidden in the archives of the Bodleian Library, Diana is forced to face the heritage she has tried so hard to forget. The power of the enchanted manuscript, known only as Ashmole 782, is both tantalizing and intimidating and she quickly sends the book back to the stacks, hoping to return to her normal life. Unbeknownst to her, she has discovered a volume that can unlock all the secrets of her world and, in doing so, has ignited a war—and made herself the prime target. Drawing on a wealth of knowledge about alchemy and the history of witchcraft, Deborah Harkness has crafted a fast-paced, intensely readable novel of magic, adventure, and romance. A Discovery of Witches charts Diana's struggle to accept her family's magical legacy, her growing understanding of the scope of the battle she has begun, and her dangerous alliance with handsome geneticist—and fifteen-hundred-year-old vampire—Matthew Clairmont. Vampires, known for their jaw-dropping good looks and seductive charm, aren't supposed to associate with witches, but Diana's discovery has caught Matthew's attention. Contrary to everything she has been taught and despite her initial reluctance and suspicion, Diana joins forces with Matthew to battle the dark spirits that are gathering around them. But cooperation quickly leads to attraction as Diana and Matthew begin to fall in love—an act forbidden by the Congregation, the covenant of witches, daemons, and vampires who dictate the rules of behavior for all underworld species and have the power to cruelly punish those who break them. A complicated yet entirely relatable heroine, Diana must discover the surprising truth of her own legacy and realize the strength of her magic in order to prevent Ashmole 782 from falling into the wrong hands. Her journey, as well as her relationship with Matthew, will keep readers turning pages late into the night and have them hotly anticipating the next stage in her adventure. 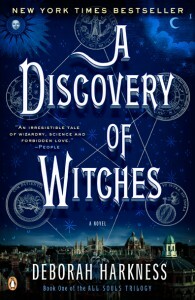 A world filled with enchantment and danger, sorcery and science, A Discovery of Witches is a sophisticated and smart novel that blends the excitement of a classic supernatural thriller with the intelligence that could be provided only by a respected scholar and skilled storyteller like Deborah Harkness. 1. Diana's mother says that fear is "the strongest force on earth" (p.5). What does she mean? Do you agree? 2. Early in the novel, Harkness describes the typical personalities and physical traits of daemons, witches, and vampires. If you could be any one of these beings, which would you choose and why? 3. Who is the Congregation? Is it a force for good or a force for evil? 4. What happened to Diana's parents? What were they trying to hide? 5. Diana studies alchemy, which she defines as a type of "science with magic" (p. 73) used to explore and understand unexplained phenomena. Do you use astrology, fortune-telling, or ESP to provide a deeper understanding of events in your own life? 6. Why is Diana and Matthew's love forbidden? Have you ever loved someone whom your family or friends thought was inappropriate? How did their reaction influence your feelings? 7. Most of the book is told from Diana's perspective, yet a few chapters are written in the third person. Why? What feature or purpose unites those chapters? 8. Diana and Matthew travel back to the sixteenth century. If you had the power to time walk, as she does, what period in history would you visit? 9. In chapter 31, Diana remembers the bedtime story her mother told her as a child. In what ways does that story foreshadow the events of Diana's life? 10. Harkness presents the use of witchcraft not only as an otherworldly ability but also as a part of everyday life; for example, Diana uses a spell to fix her washing machine. Which example of the novel's blending of the magical with the mundane did you find most entertaining or creative? If you could use magic in your daily life, what would you use it for? 11. Look at the last page of the book. What is the significance of the blood and mercury? What is the reason behind the sense of relief felt in the house? What does the last sentence of the book mean? Deborah Harkness’s A Discovery of Witches, the thrilling debut novel in the All Souls trilogy, exploded onto the literary scene, becoming an instant bestseller and leaving fans breathless with its cliffhanger ending. Now, in Shadow of Night, Harkness returns with feisty heroine Diana Bishop and her continuing search for the enchanted manuscript known only as Ashmole 782. The new novel finds that Diana has traveled back in time, embraced her magical abilities, and confronted Matthew’s complex past as a fifteen–hundred–year–old vampire—but is she risking too much? The year is 1590, Elizabeth is queen, and all of Europe is aflame with witch burnings. Into this world of danger and conspiracy arrive Diana and Matthew. She has timewalked them from today to sixteenth–century England in the hope that they will track down Ashmole 782 and unlock its secrets. But Diana must also find a guide to help her master her powerful yet unpredictable magic. From the moment they arrive in the past, Diana can see the threads of time unraveling, but has no idea how to control them. Harkness draws on her talent for storytelling and her experience as a historian to create a richly textured, authentic world, surrounding her characters with details of Elizabethan life large and small: Diana mingles with Sir Walter Raleigh and Christopher Marlowe, is present for the invention of the telescope, and dances at the court of the Holy Roman Emperor. For Matthew, sixteenth–century life is a return home: to his country manor, to his family, and to his life of royal espionage and international intrigue. This meticulously researched milieu is the setting for an expansive and fast–paced adventure that stretches through centuries and around the globe. In a world filled with supernatural subterfuge where even thoughts can be dangerous, Diana and Matthew discover unexpected allies; loyalties hundreds of years in the making are tested, and courage comes from the least likely of corners. From royalty to half–mad alchemists, Matthew and Diana find that they aren’t the only ones seeking the manuscript. While Matthew attempts to make peace with his troubled past, Diana uncovers a disturbing prophecy for her future—one that could put those she loves most at risk—as Ashmole 782 begins to reveal its dark secrets. Deborah Harkness is the author of the bestselling A Discovery of Witches and is also a historian specializing in the history of science, magic, and alchemy. She has received numerous awards, including Fulbright, Guggenheim, and National Humanities Center fellowships, and is currently a professor of history at the University of Southern California. Q. Because you are a scholar, your work is based on constant research and analysis; the novel is filled with details that could come only from extended historical work. Do you find a difference between researching for academic purposes and for creative writing? How long did it take you to gather the information for Shadow of Night? In a way I’ve been researching Shadow of Night since 1982, when I first began studying this period in earnest, though my interest in Elizabethan England extends beyond that into my childhood and teen years. No matter how much I’ve read or how many documents I’ve consulted for my scholarship, however, when writing Shadow of NightI found there was still so much I didn’t know, such as how far and fast a horse could travel in a single day in November or what people ate in December. It was an exciting, humbling experience to write this book. Q. Your field of specialty is Elizabethan England and the history of science. Is there anything about the period you’d like readers to know that didn’t make it into Shadow of Night? Did you have to leave anything out? How much space do we have for my answer? Seriously, if I had put everything into the book I wanted to in terms of historical detail, the book would have been six or seven times as long! In the end, I set myself this test: If I was writing about the present, would I stop to describe this shoe/breakfast/shop? If the answer was no, I kept the story moving. If the answer was yes, then I tried to tell the reader the most important historical details, but it was still not everything that I might have shared. Q. When we last spoke, you had just published your debut novel, A Discovery of Witches. At the time, you said, “Novelists, like the alchemists of old, know that true creation takes time and patience, and that it’s likely you will have many disasters and failures before you achieve success.” Does this statement still reflect your feelings about writing? Could you share a few details about your development as a novelist between the two books? Writing a second novel was very different. Writers I’ve spoken to often tell me that books are like children: No two are the same. That was certainly the case with Shadow of Night. I really struggled with the beginning and the most effective way to arrange the plot, much more so than with Discovery of Witches. Even in the last month of writing, I was making major changes in the sequence of events. Q. You added notes at the end of the book that some of the characters (major and minor) are historical figures. Can you say something about the interplay between real people and fictional characters in the novel? Back when I started A Discovery of Witches and was first imagining this story about an ancient vampire scientist and a reluctant witch, I thought, “Wouldn’t it be fun if my vampire was someone who really lived, someone mysterious who knew interesting people but remained in the shadows?” I knew of just such a person in Elizabethan England, the poet–spy Matthew Roydon. From that moment on—and this was in 2008, so it was some time ago—Matthew Roydon’s life story determined a great deal about Matthew Clairmont’s intellectual habits and his taste in friends. A historical figure like Matthew Roydon is a novelist’s dream, because what little we know about him is so fascinating and leaves so much room for creative invention. I like to think that the historical characters add the same air of verisimilitude to this book set in 1590 as going to yoga and entertaining trick–or–treaters did to A Discovery of Witches. As for the minor characters, I drew them from interesting individuals I’d come across in my research. They are usually people about whom I wanted to know more, but there is, alas, no further evidence about them. Q. In this novel, Diana learns to use her magic and Matthew comes face–to–face with his past. How does this empower and change them? Facing who you are is the most empowering thing a person can do, so it isn’t surprising that their experiences in 1590 change Matthew and Diana enormously. And long–lasting relationships are built on honesty and acceptance, so this changes not only Diana and Matthew individually, but also who they are as a couple. Q. Two of our characters are Hancock and Gallowglass. How did they arrive on the scene? One of the most exciting aspects of writing fiction is I never quite know what’s going to happen next. In A Discovery of Witches, Matthew was suddenly driving around in a car and when he stopped, Hamish was there to greet him. I had no plans for Matthew to have a best friend, but now I can’t imagine life without Hamish. It was the same thing with Gallowglass and Hancock—although slightly more dramatic as befits their characters! I was settling in to a cozy evening in front of a fire at the Old Lodge when a storm blew in, carrying Gallowglass and Hancock with it. Once they were there, I fell in love with their banter and the way they are constantly puncturing Matthew’s confidence. Q. In your personal reading, do you gravitate toward supernatural and/or historical fiction? How have your own reading tastes shaped this novel? I don’t read much fiction, to be honest, and with the exception of the Harry Potter series I haven’t read supernatural fiction since I was a student and read Anne Rice. As for historical fiction, I like historical mysteries set in the eighteenth and nineteenth centuries but don’t read much else. I find it hard to relax when reading works set in the periods of history I know best. Q. 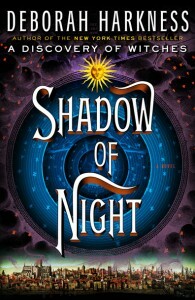 If you had to pick one book (besides your own) to be a companion piece to Shadow of Night, what would it be? That’s a great question. I think it would have to be Christopher Marlowe’s Doctor Faustus or a book about Marlowe, like Charles Nicholl’s The Reckoning, which brilliantly conveys how tricky it was to lead a double (or triple) life in Elizabethan England. Of course, a Shakespeare play like Loves Labours Lost or The Tempest would also be an excellent choice. Q. Any hints about what will happen next to Diana and Matthew? Diana and Matthew will face an interesting problem in the next book: They have been dropped into a world where time has passed and people have lived their lives as best they could, and they will be expected to step back into a whirl of action and reaction. I would expect some reunions and some farewells, some fascinating new characters as well as old friends and, of course, finally learning what it was that the witches discovered.. . . .
1. Harkness opens Shadow of Night with a quote by Queen Elizabeth I. How is the quote significant to the book? 2. The Elizabethan era is made vivid in the novel through the everyday details that Diana must contend with. What did you find most surprising, funny, or intriguing about life in the sixteenth century? 3. When Diana arrives in 1590, she is thrilled to experience firsthand a world that she had studied as a historian. If you could go back in time, what era would you visit? What would you do while there? 4. There is no question that Matthew is a compelling character, but is he a traditional romantic hero? Compare him with some of your favorite leading men in literature. 5. Who were the School of Night? What is the meaning behind the title Shadow of Night? 6. In Shadow of Night Harkness cheekily refers to Shakespeare’s plays without naming them. Can you recognize which work she’s referring to? 7. What does Diana learn about the materials used to make Ashmole 782? 8. If Shadow of Night was a film, which celebrities would you cast in the starring roles? 9. Did you read A Discovery of Witches? If so, in what ways has Diana changed since the last novel? If not, how did your own opinion about Diana change through the course of the book? 10. A Discovery of Witches ended with a cliffhanger. At the end of Shadow of Night, what do you think lies ahead? In The Book of Life, historian-turned-novelist Deborah Harkness delivers the breathtaking final installment of her #1 New York Times bestselling All Souls Trilogy. At the end of Shadow of Night,time-walking weaver witch Diana Bishop and vampire Matthew Clairmont are newly returned from the year 1591. There—after an extended sojourn in France with Matthew’s father, Philippe de Clermont—they pursued the mysterious volume, Ashmole 782, from the court of England’s Queen Elizabeth to Emperor Rudolf II’s Prague. Now back in the present, married, and expecting twins, Diana and Matthew must out-maneuver both the Congregation and an even more sinister enemy who’s been lurking in the shadows since the very beginning. Much has changed since Diana and Matthew embarked on their journey. Emily Mather—the beloved partner of Diana’s aunt, Sarah—has died under suspicious circumstances. Was it the Congregation? Diana suspects yes, and she is prepared to make them pay. While Satu easily dominated a spellbound Diana in their first encounter, the witches in Elizabethan England helped Diana to unlock her unique abilities as a weaver witch. Accompanied by a firedrake named Corra, the Diana that returns to the present shimmers with power. As her nephew Gallowglass states, “I did warn everybody that Auntie Diana wasn’t going to be the same witch she was before” (p. 9). Diana also returns as Philippe’s blood-sworn daughter. Baldwin—the official head of the de Clermont clan—was unwilling to defy the Congregation and support Matthew’s relationship with Diana. Now, Baldwin is compelled to treat Diana as a sister. Despite their father’s vow, however, the rift between Baldwin and Matthew grows wider—especially after Baldwin learns that Matthew is tainted by the vampire scourge known as blood rage. Meanwhile, Benjamin—the son whom Matthew renounced centuries ago—launches a ruthless game of cat-and-mouse designed to topple the de Clermonts and to acquire both Ashmole 782 and Diana for his own nefarious purposes. At a Yale University lab, Miriam, Marcus, and Diana’s best friend, Chris, work furiously to uncover the genetic roots of blood rage. Although Marcus did not inherit his father’s blood rage, he is a carrier, and the de Clermonts must face the possibility that Diana and Matthew’s unborn twins will be infected—especially after two familiar faces from 1591 unexpectedly appear in New Haven. The secret of blood rage may also be locked within Ashmole 782, so Diana sets out to find the final missing page, hoping that—once returned to wholeness—the volume’s hidden text will reveal itself. As old friends—and older enemies—converge for a final battle, Diana and Matthew must face their darkest fears to protect the new lives they have created. 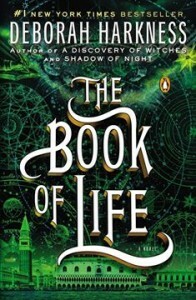 Masterfully drawing together timeless themes of passion, loyalty, and family with the history, magic, and science that have dazzled readers from the very first pages of A Discovery of Witches, Deborah Harkness’s The Book of Life is a triumphant conclusion to one of the most beloved series of recent times. Q. When you first began the All Souls series, you were also writing about wine for your award-winning wine blog and teaching at USC. How did you find the time to write a novel? What advice would you give to aspiring writers? Every novel that has ever been written was written one word at a time, one page at a time. That’s how I wroteA Discovery of Witches—and indeed all of the books in the All Souls Trilogy. As time went on, and my life became a bit more complicated, something had to go. I haven’t blogged about wine in years, though I’d like to get back to it one day. My advice to writers is simply to make writing a daily practice, like breathing. Don’t psych yourself out, and don’t take on a whole novel at once. One word at a time. One sentence at a time. One page at a time. That’s how it’s done. Q. In The Book of Life you elegantly wrap up all the mysteries you introduced in A Discovery of Witches, including why creatures weren’t allowed to intermarry, what was hidden within Ashmole 782, and who committed London’s “vampire” murders. Did you have the entire arc of your fifteen-hundred-plus page saga sketched out from the very beginning? Q. You preface each section of The Book of Life with astrological information taken from an “Anonymous English Commonplace Book, c. 1590.” Did you write these yourself, or are they drawn from an actual text? Q. Your field of study, the Elizabethan Era, predates the mapping of the human genome by more than four hundred years. What inspired you to make Matthew a geneticist and to bury the secret of blood rage in the vampire’s noncoding DNA? Q. Was researching genetics more or less difficult than researching alchemical texts? Q. Your storytelling prowess testifies to your skill as a weaver witch, but if you could choose another identity, would you want to be a vampire, daemon, or another type of witch? What is the one creature power that you wish you could have? Q. Who—besides Matthew and Diana—are your favorite characters from the series? Do you still think about your characters and what they might be up to now? Q. J. K. Rowling has famously expressed regret over the fact that Hermione marries Ron instead of Harry. In retrospect, is there any part of the series that you wish you had resolved differently? Q. In the academic realm, a print run of 5,000 is considered substantial. Did you ever dream that you would become a #1 New York Times bestselling novelist with millions of copies in print around the world? How has your success affected your academic career? Q. Has writing fiction changed the way you approach your academic work? Q. What is the most surprising comment you’ve ever received from a fan? Q. Do you have any details to share about the planned BBC adaptation? 1. Throughout The Book of Life, the ghosts of Philippe de Clermont and Emily Mather observe what their loved ones are doing in the world of the living. Have you ever felt the protective presence of friends or family who have passed on? 2. Although we don’t meet Matthew’s nephew Gallowglass until Shadow of the Night, we learn that—under orders from Philippe—he has been protecting Diana from afar since she was born. We also learn that Gallowglass has fallen deeply in love with Diana. How did this knowledge affect your opinion of him? Are there ways in which he might have made Diana a better mate than Matthew? 3. After they meet at Sotheby’s in Shadow of Night, Marcus and Phoebe fall in love. Phoebe agrees to become a vampire in order to become a near immortal like Marcus. Compare her decision to Diana’s decision to remain a warmblood. What are the pluses and minuses of each woman’s choice? 4. Advances in genetics have now made it possible for us to learn if we carry genes for a variety of heritable diseases. Would knowing that your romantic partner was a carrier for something as potentially dangerous as blood rage prevent you from marrying and/or having children with him or her? 5. Matthew’s centuries-old decision to let Benjamin live set in motion a chain of events that threatens Diana as well as their newborn twins. To what extent is Matthew responsible for the suffering that Benjamin has caused? 6. Several characters from earlier in the series return to play a part in the final volume, including Jack, Father Hubbard, and Timothy Weston—the daemon from the Bodleian. Whose reappearance astonished you the most? Whose absence did you find most painful? 7. After his violent confrontation with Matthew at the twins’ naming ceremony, Baldwin transforms from imperious bully to gracious brother. If you were Diana, would you be able to forgive him for his earlier behavior? 8. Matthew deliberately walks into Benjamin’s trap, initiating the Queen’s Gambit, a chess move that he habitually avoids in order to protect his queen. In this case, he puts his queen—Diana—into play against Benjamin. Were you surprised by Matthew’s decision? Would it have been possible to overcome Benjamin if Matthew hadn’t allowed Diana to risk her life? 9. The de Clermonts eventually discover that Gerbert—the vampire who led the congregation in denouncing Matthew and Diana’s relationships—had himself been consorting with witches and daemons for centuries. Unfortunately, the news is full of illegal and often hypocritical acts committed by people in positions of power. Do you think that it’s power that corrupts, or are the corrupt more inclined than most to seek power? 10. What do you think the future holds for Matthew and Diana? Which characters from the series would you like to have learned more about?